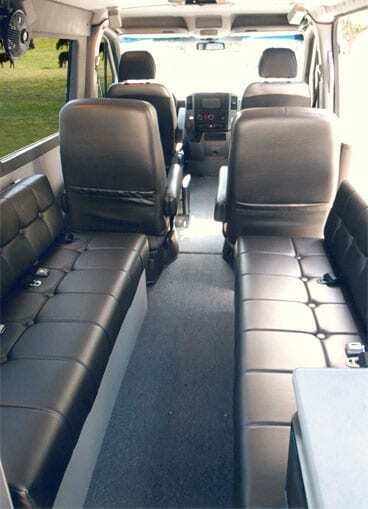 A comfortable roomy interior with lots of legroom — What better way to travel in town or cross-country. Sprinters large windows provide great viewing visibility. The flip down TV/DVD will keep the kids entertained if the scenery gets boring. Sprinters full-height sliding door makes getting in and out easy.The rear has a microwave and refrigerator cabinet for quick snacks. A toilet compartment on the opposite side further adds to the convenience of travel in a Sportsmobile. Third and fourth seats are nicely styled. Special thick molded foam assures travel comfort. All seating, incluing the cab, is upholstered in Ultraleather (O). It’s very soft and durable. Actually breaths better than leather. Dinettes quickly convert into a very large bed. Or lay one side down and leave the other side up for seating. Seats include seat-belts. Seat cushions hinge up for storage access.